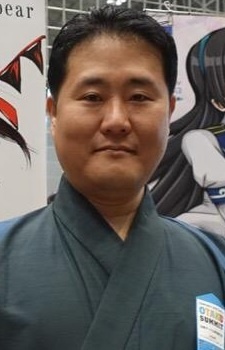 Recently known for his work in Strike Witches doujinshi (Witches in Africa). Nogami started his professional mangaka career with Koutetsu no Shoujo-tachi (a.k.a Panzerfraulein) published by Kadokawa Shoten, which due to various circumstances, was cancelled by the publisher after volume 4. Now, his activities include Sailor Fuku to Jyuusensha, a comic about tank-riding high school girls published by Akita Shoten; Tsuki no Umi no Rua, a comic inspired by Kaguya-hime tales in a World War II setting, from Shonen Gahosha; and the comic for Moeyo Sensha Gakkou! !, a semi-educational book about tanks from Ikaros Publishing. As visible in his portfolio, he seems to be inclined towards military-themed stories. This mangaka can boast having not one, but two, anime characters based on him: Takeko Nogami in Girls und Panzer, and Takezou Nogame in Shirobako.